In the pursuit to incorporate her passion into her professional life, Paula Gillikin sought further education, and found a graduate program that would help fulfill her aspirations. During her time in the Master of Science in Animals and Public Policy program (MAPP), Paula joined Dr. Allen Rutberg in a field project that would ultimately put her on the path to her current career. The North Carolina Coastal Reserve and National Estuarine Research Reserve (NCCR/NERR) protects more than 41,000 acres of estuarine land and water over ten sites. As Central Sites Manager, Paula manages all aspects of two of those sites—the Rachel Carson and Permuda Island Reserves. 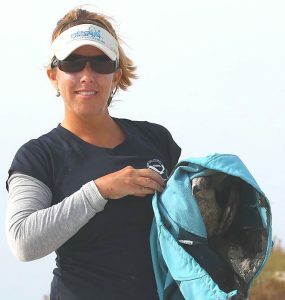 Much of her time on the job is spent in the field, monitoring site conditions, responding to visitor use issues, providing education and outreach, captaining the Reserve’s passenger vessel, and managing the wild horse herd. Below, Paula talks about the challenges and rewards of her job, as well as how her Master of Science in Animals and Public Policy has helped lead her on her journey. I was fortunate to work in the field on one of Dr. Allen Rutberg’s white-tailed deer immunocontraception projects. 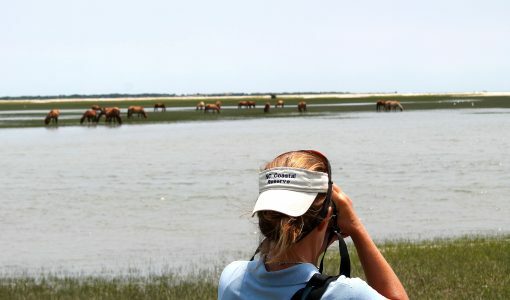 This led me to assist with another immunocontraception project focusing on a different species—wild horses located on an island research reserve in Beaufort, NC. The Reserve program staff thought I was a perfect fit to manage the horse herd and the Rachel Carson Reserve and approached me with a job offer. It was history after that! What projects have you completed in the past year at NCCR/NERR? I worked on two major projects. First, I helped to develop a Geographic Information Systems-based tool and policy that informs decisions about protecting Reserve resources, including habitat and wildlife. I also led a National Oceanic and Atmospheric Administration (NOAA) -funded project using drones to detect and prioritize removal of marine debris from sensitive habitats. 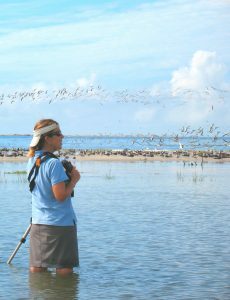 Paula conducts field surveys during spring and fall migrations for the International Shore Bird Survey. What is your biggest “on the job” challenge and what helps you work through it? Carrying out the organization’s mission under varying political conditions and a unique organizational structure (State-Federal partnership housed in a regulatory agency) are both my biggest challenge and opportunity. Being a public employee in my position means being committed to protecting a public resource while carrying out the mission of the program, the agency, and the department. This complex system can be tricky to navigate and there are often conflicting interests and barriers that are tough to overcome. Resourcefulness, persistence and adaptability help me best work through these challenges. These are skills and values that MAPP students will find to be invaluable as they move forward with pursuing their careers. My position offers a great mix of experiences: field work; policy analysis and development; leading and participating in collaborative processes; and interacting with researchers and the community members who use the sites. And then there is the location—with beautiful coastal estuaries and an abundance of wildlife and culture. Sometimes, I have to do a reality check as I am driving the boat around the Reserve with the sun rising and wild horses and birds surrounding me. Paula helps to disentangle a gull that was trapped in mono-filament. Why do you think you’ve been so successful? I follow a very basic recipe for success that involves pursuing a passion while exercising the qualities of integrity, persistence, level-headedness, and resourcefulness. How would you describe your experience as a student at Cummings School? Being a student at Cummings School met all of my expectations and more. I was exposed to a broad array of subjects and subject matter experts that helped hone my professional and personal interests in advancing the humane treatment of animals. Additionally, I was happy with the opportunities available for volunteering. I learned new skills and helped community members through programs such as the Pet Loss Support Hotline and Paws for People. Who was your favorite faculty member in the program and why? Dr. Rutberg, because he likes Australian Shepherds. JUST kidding—had to throw some humor in there. What is your favorite memory from the MAPP program? 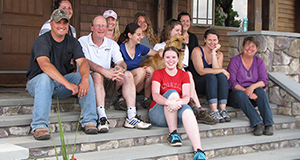 My favorite memories are of interacting with guest lecturers from throughout the animal welfare and policy community, from advocates to researchers. A personal highlight was meeting Temple Grandin.